If you suffer form heartburn frequently, you would be interested in knowing the connection between heart burn and weight gain. Heartburn is one of the symptoms of acid reflux. Acid reflux is a medical condition in which the gastric or stomach acids are thrown up in the esophagus and the esophageal lining gets damaged in the process. Acid reflux has several symptoms like heartburn, regurgitation, chest pain, dysphagia, painful swallowing, chest pain, asthma, excessive coughing, hoarseness, belching, bloating and dental erosion. GERD or gastroesophageal acid reflux disease is the acid reflux that is experienced by people on regular basis. Heartburn is a painful burning sensation in the throat or chest area and it is generally felt after having a meal. It is one of the symptoms of acid reflux. Acid reflux is caused due to manifold factors like genetics, dietary intake, lifestyle, excessive fatty foods, alcohol, caffeine, smoking, Candida infections, delays in stomach emptying, obesity and pregnancy. As obesity is one of the causative factors of acid reflux, there is a definite link between heart burn and weight gain. Studies have shown that women who gained few extra pounds were susceptible to experiencing frequent heartburns. Even a moderate weight gain doubled the risks of getting acid reflux and heartburn. Decreasing weight brought down the risk by about forty percent. 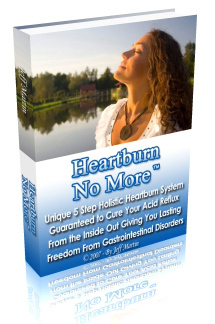 Patients who lost weight about twenty five pounds discontinued the medication for heartburn. Heartburn that is experienced regularly is the result of the gastric acid being thrown up in the esophagus. A burning pain is created in chest or the person may feel a bitter taste in the mouth or throat.Boston University Medical Center doctor says that the patients can easily discontinue the heartburn medicines when weight decreases. Even a slight weight decrease makes a great difference in relieving the symptom of heartburn in acid reflux. Research studies in the US have proved that there is a strong link between heartburn and weight gain. The obese and overweight persons are more prone to frequent heartburns. The odds of experiencing heartburns are doubled in the case of obese persons. The stomach pressure increases with BMI or body mass index increase and this leads to acid reflux. The excess fat that is deposited in the abdominal area increases the stomach pressure. The increased stomach pressure thrusts the sphincter muscle in between the esophagus and stomach to open. The stomach pressure can be increased due to overeating and pregnancy. You can take the conventional medicines to treat heartburn, but these are going to offer you only temporary relief and the underlying cause remains untreated. The conventional medicines could be antacids, proton pump inhibitors, acid suppressants and prokinetic agents. If these medications are taken on a long term basis, they might have harmful side effects. The best way to tackle the problem of acid reflux and heartburn is to follow the holistic approach for treating. The holistic approach is safe and effective and makes use of alternative treatments like naturopathy, homeopathy, lifestyle changes, diet changes and herbal remedies. The root cause is treated successfully.